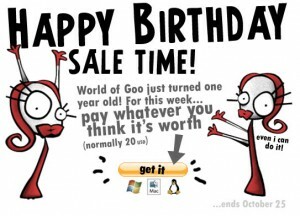 Some of you may remember my World of Goo review for the Modern Day Retro section a while back – well turns out that game is over a year old, and they are now celebrating by having a three day donationware sale. I would urge you to donate whatever you can to this ace game. It’s by far the best puzzle game released in the last 4 years, with great graphics, amazing soundtrack, and is more addictive than crack flavoured Pringles. And hell, if you want to donate $0.01, then you can, but really, donate more you tight arse! Incidentally, I donated $1. Largely because I had the game already on the Wii. Be sure to tweet/stumble/share this, as it’s a crime if this game goes unnoticed. Click here to get this game.